It's an actual game now! So, first things first - here's the current version of Rocks! It's looking a lot more like a real game now. 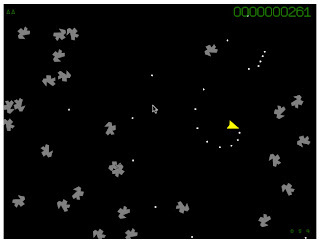 Oddly enough, the hardest thing for me so far has been making those decidedly "retro", simple sound effects. The Web Audio API is very powerful, but it's also very much focused on doing sophisticated manipulation of sampled sound. I certainly could have grabbed appropriate sampled sounds, or built some in Audacity, but I wanted to push the "classic" feel of the thing, and I thought - "I've done this sort of thing before, how hard can it be"? Besides, attaching a couple of huge sample files to a game that's currently under 20kb total in size felt a bit like the tail wagging the dog. Of course, the last time I tried to create synthesized sounds from scratch was probably 30 years ago, on an 8-bit home computer with a fixed-voice synthesizer chip. There's something to be said for the existence of fewer choices helping to focus your efforts. When you're faced with an API that supports multi-channel surround sound, arbitrary frequency- and time-domain manipulation, 3-D positional audio, dynamics compression, and all the rest, it's a little difficult to figure out how to just make a simple "beep". This is enormously-flexible, and each of the individual node types is jut about as simple as it can be to do the thing it's designed for. There's a "gain" node that just multiplies the input by a constant and feeds it to the output, for instance. The source nodes don't have individual volume controls (because there's the gain node for that). There's one weird quirk to my old-school sensibilities, which is that every note requires making another source node and connecting it to the node graph. When a note stops playing, the source node is automatically removed and garbage collected. If you want to play the same sound over and over, you're continuously creating and destroying nodes and connecting them to the graph. Back in the day, we'd set up ADSR (attack, decay, sustain, release) parameters for a sound, which would control how quickly it came up to full volume, how loud it was as the note progressed, and how quickly it faded. There are probably about 10 different ways to do the same thing in Web Audio, but nothing with the same simplicity. Despite the fact I wasn't trying to anything particularly sophisticated, I ran into a few bugs in both Safari and Chrome. I imagine a certain amount of this is to be expected with an in-development API that hasn't been standardized yet. The next big feature for Rocks! is to have some enemies to chase you around and shoot at you. One Game a Month, One Blog a Month? No matter how much I promise myself I'm going to update my blog more often, it tends to languish. I have a bunch of half-written articles waiting to be published, but in the absence of any compelling deadline, I can continue to look at them as "not quite ready for public view" for forever. Something I've seen work really well for other people who struggle with producing consistent output are what I think of as "creative challenges". Things like the "take a picture every day for a year" challenge that a lot of people are doing to improve their photography. I just can't face the idea of a "blog a day" challenge, though - I like the idea of something a little more long-form, and a daily deadline would force me to cut corners to an extent I'm not ready for yet. So instead, I signed up for the OneGameAMonth challenge. Game design is one of my non-programming passions, so I feel like I'll be able to stay motivated and really try to see this through. A month is a long-enough deadline that I feel like I can produce something worth examining, and the practical problems and "stuff I learned along the way" should provide ample material for *at least* one blog entry a month. And here's the GitHub repository for it. 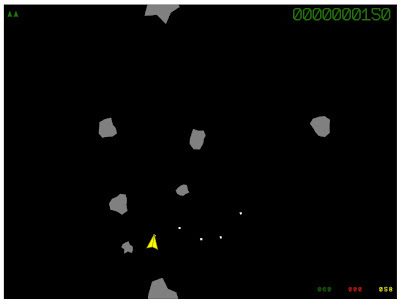 This is an HTML5 Canvas & WebAudio version of the old Asteroids arcade game. Because it uses some cutting-edge web features, it only runs properly in recent WebKit-based browsers. That's Google Chrome and Safari. Future games will likely be more cross-platform, but I wanted to learn a bit about the Web Audio API.